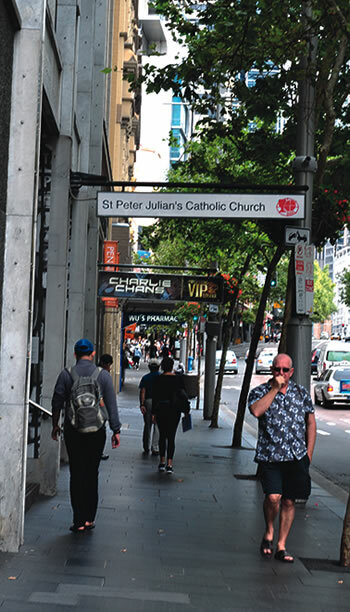 Located on a busy street a couple of blocks away from the Sydney Town Hall in the heart of Chinatown, you would be forgiven for not recognising St Peter Julian’s as a church. The first time we visited the church a few years ago, it was entirely by accident, just walking by and discovered it. Mass just happened to be starting, with a very multi-cultural congregation. I was not surprised to learn that Masses for the Korean and Cantonese communities are said every Sunday, as well as regular Masses in Filipino and Indonesian. Because our experience was a memorable one, we recently made a special effort to revisit the church during the day when nothing was going on. The first surprise when entering the church is the sheer size of the interior, and how well lit it is. There is some artificial light, but the row of stained glass windows high on each side bring in a warmth that adds to the beautiful timber that is everywhere. There is so much to take in, a bit at a time. The first thing I noticed was the absolute peace and quiet, despite the noisy street outside. Sitting at the back, all I could hear was the faint trickling of water circulating in the font. Then there is the horseshoe shape of the seating, with the small oval altar almost in the middle of the church. 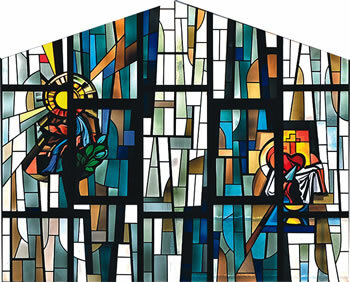 At the rear there is a wall of coloured glass, with the white panels making the shape of a cross. 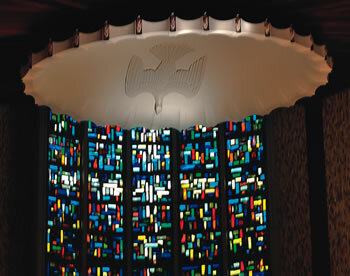 Above the window was a round canopy embossed with the shape of a dove descending, representing the Holy Spirit. 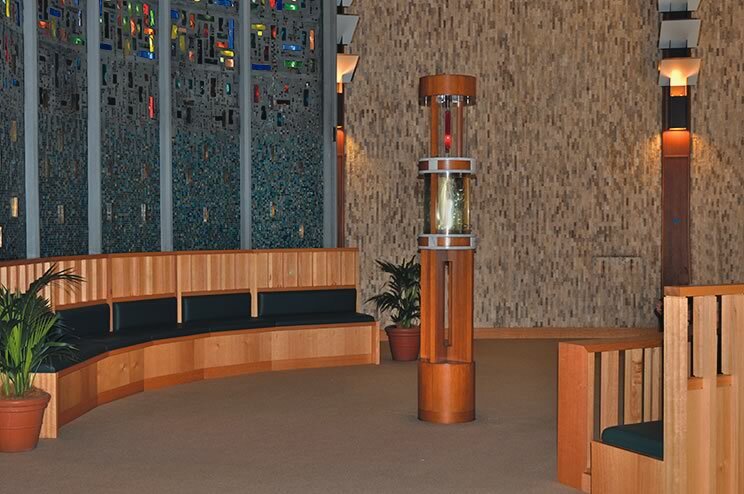 On each side there is an extension to provide separate praying areas, and on the front wall of the left one was a beautiful mosaic of the Blessed Mother and child Jesus. 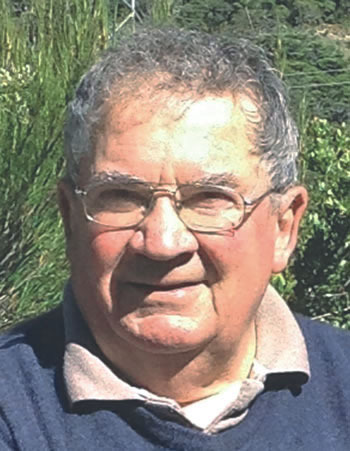 It has featured in the Marist Messenger before (Feb 2014), but here it is again for you to adore, as I do. On the opposite side is a bronze statue of St Peter Julian Eymard, who was ordained as a French diocesan priest in 1834 before being professed as a Marist in 1840. He left the order in 1856 to establish the Blessed Sacrament Congregation. I had seen the light of the Tabernacle underneath the canopy, but failed to realise that it was partially fenced, with seating behind the fences so that those wishing to could sit in close company with the Eucharist in relative privacy. Here was a Eucharistic shrine within a shrine. 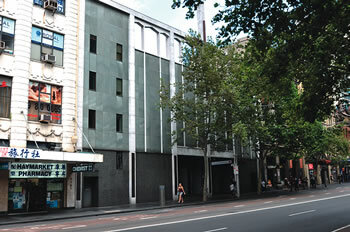 Reluctantly I left the haven of peace and the very real presence of Jesus that this surprising church provided for the heat, hustle and bustle of one of Sydney’s busiest streets.